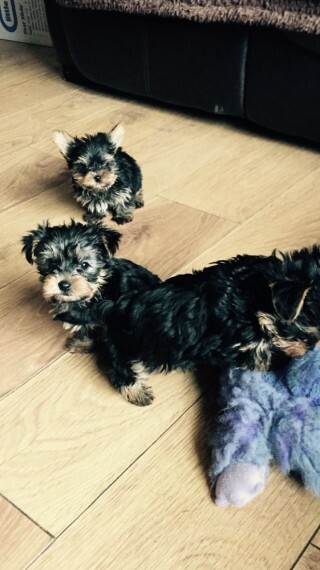 3 stunning very small teddy bear face yorkie pups 2 girls and 1 boy. they are just over 8 weeks old so ready for their new loving homes. Puppies have been reared in our home so are used to every day activity. Mum is my little Missy who is a lovely natured little girl who is pedigree dad is a small well bred kc yorkie .stud dog..I have wormed these pups from 2 weeks old so are up to date. they have been fully vet checked and had there 1st vaccination. These babies are only small so I urge anyone contacting to realise it wouldn..t be suitable to have them around small children. They are used to my dogs but they are only small so please consider your surroundings before you contact me. Puppies will leave with 5 generation pedigree not kc. vaccination card microchipped. a puppy pack containing food. toys. treats. scented blanket. and puppy pads.